There has always existed a large group of valve lovers who prefer to design and build their own tube amplifiers instead of simply buying them in a shop. Money has never been problem for them. It's the warmth of the soldering iron and the odour of soldering which attracts them. There is no greater happines than to see valves start glowing and to hear the warmly sounding music from your amplifier for the first time. Troubles finding suitable electronic and mechanical components are soon forgotten. It has been our aim to help such audio enthusiasts by offering either a complete kit for a tube amplifier or only some vital components and parts. In this way we help them to avoid problems in finding these parts and still retaining the thrill of making something personal and unique. The integrated tube amplifier ASV KTA-60 is at your disposal. It is the result of years of careful and persistent development and design. There have been no compromises in achieving ultimate quality. The ASV KTA-60 has been designed as a stereo 2x30W block fitted in the housing containing two power stages, a power supply and a passive preamplifier stage with inputs for CD, tuner and tape. A high quality input switch and a stereo input potentiometer are fitted at the input. Thanking to a relatively high input sensitivity, no separate preamplifier is needed, except for phono cartridges. The housing is made of quality varnished steel sheet. 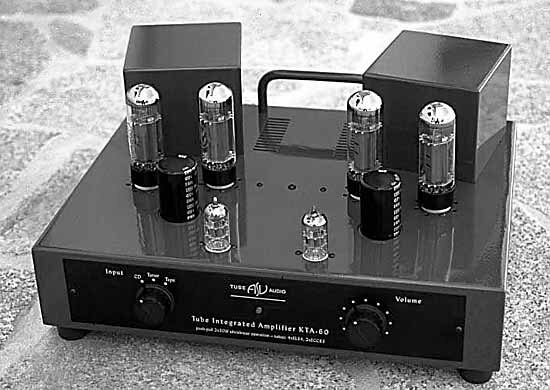 Large metal feet and array of tubes and supply capacitors on top panel all together contribute to an overall elegant look of the tube amplifier. The output transformers are fitted in metal cases on top, behind the valves, and their cases can also be chrome-plated on request. Rear panel is fitted with all input and output terminals and the power switch. All components built in the ASV KTA-60 have been carefully selected: polypropylene capacitors, metal film resistors, ceramic tube sockets, toroidal power transformer, high quality electrolytics. In the basic design the simplified principles of Williamson topology have been followed. As active components in the input and the driver phase-splitter stage dual triodes ECC 83 (12AX7) are used. In the power stage the EL 34 (6CA7) pentodes are employed in the cathode bias curcuit. They work in the push-pull AB1 configuration with a high quality output transformer. However, for sophisticated constructors it wouldn't be difficult to add two switches: one for selection between ultralinear and triode configuration of output valves and one for selection of negative feedback. A high quality output transformer is the heart of a tube amplifier. A poor output transformer fitted in a well designed amplifier will spoil its performance. Needless to say that the design and optimization of an output transformer takes high skill and know-how because performance requirements are complex and high. The transformer must deliver adequate and constant power without core saturation. It should provide wide frequency bandwidth at minimum distortion. Moreover, it should provide constant outstanding performance to retain the open, spacious qualities of recorded music. The sound quality of ASV output transformers is exceptional: low distortion and an extremely wide frequency and dynamic ranges. The present transformers have a high quality double C core and have been carefully wound, have no internal solder joints and are impregnated and encapsulated in a metal housing. The final results are excellent and also confirmed by measurements. In the basic model of the ASV KTA-60 the output pentodes EL 34 work in the so-called ultralinear push-pull configuration without negative overall feedback. This provides a clean, airy performance and is capable of delivering truly classic and warm tube sound. It re-creates a glory of tube sound, it focuses well, has very good depth and transparency with fine image width. The ASV KTA-60 tube amplifier has been designed for assembling in the classical manner of manual soldering of all components and joints. All elements and connections are entirely hard-wired on the circuit assembly. No printed circuits are used in this amplifier. We believe that only such a design can together with a great degree of skill, know-how and enthusiasm provide the result: warm natural sound without disturbing, sharp transients. The time invested in the assembling of this tube amplifier will be rewarded by an outstanding quality of reproduction which can be enjoyed for hours and hours. Have a lot of fun and pleasure assembling this unit and listening to the music!